When my friend sangeeta left Singapore,I called her for lunch and this was in my menu….Her daughter and herself liked it very much,she gave her daughter, kootu with parata too and she said it was tasting good with that too! And I can say I am posting this for her and also it will help so many beginners!! 1. Remove the root part of the keerai and wash them twice in plenty of water.Keep aside for the water to drain. Mean while,pressuure cook moong and grind the coconut and keep aside.Chop the keerai finely,with stem. 2.Boil a cup of water,add turmeric,sambhar powder,salt followed by the chopped leaves.Turn the leaves after a minute to ensure even cooking.Cook till the stems are cooked well and then add the cooked,mashed moong dal and stir well. 3. Add the ground coconut mixture and mix well,bring to boil. 6.Switch off the flame and now temper with the items given in the To Temper table in order. Brown the onions nicely which is very important to enhance the flavor of the kootu.Mix well and serve as an accompaniment or mix this with ghee and rice,tastes heavenly!! 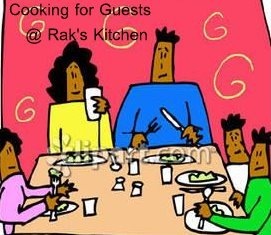 Now Announcing “Cooking For Guests” Event!! Yet another event in this blog world,but will definitely help us when we are struggling to decide what to cook for the guests coming to home!! Post the complete spread you are specially cooking for the guests visiting your home. (For example..A starter,main course,side dish,dessert….) with recipes and pictures,in your blog in between the given date of August 1 to September 15. No non.veg dishes please! If you already have the recipes in ur blog posted, link all the recipes under one new post and give at least one picture with all of your cooked items,together. Also write for whom you cooked and why you cooked those dishes if you really want to!! Name : Your preferred name to be displayed in the round up! Its not necessary that it should be a Dinner or lunch or a something specific,but it should have what you cooked for your guest,let it be a super duper spread from starter to dessert… or a simple peas pulav with dal or a korma…whatever you make specially for you guests. Please post a spread containing minimum of two or more combination recipes. The purpose is to easily get an idea of what we are going to cook completely for our guests…. Hmmm…I love greens and love them in dals 🙂 Thanks for the recipe with step by step pics. it's a fab theme!! and wishing u loads of fun hosting the event! wow there is no tomato or tamarind in this kootu great since I don't eat pulippu on Friday s this will be a great choice for me simply superb and thank you so much for this delicious recipe looks great. And coming to your event great idea happy hosting will send some sure. Nice theme Raji. Keerai kootu looks delicious! Kootu looks yumm..Iam not making it nowadays..Just kadaiyal i make..Have to do and c whether raksha eats it..Nice theme..Will send in something for sure..Happy hosting !! Hey awesome clicks and recipe .. Thanks for hosting such a wonderful event .Will surely try something . Btw ..Thanks for ur lovely [email protected] blog . Hey Haven't decided yet ..plz suggest me dear which one should i ? Heartwaaarming Koottu, with lovely pics as usual…One of my husban'd favourites..
Oh wow…..that's an awesome recipe…..never tried with moong dal and coconut….looks yum…. Coming to event….sounds gr8…will have to wait for the guest…hehehehe…. have something for u if time permits,..:-)hppy hosting,..
Lovely theme.. happy hosting dear!! Lovely Kootu, very beautiful photographs. Will definitely send entries for the event. The fried onions on top is such a fabulous idea and keerai kootu is my favorite. Have not made it with sambar powder before. Awesome event!!! Will definitely try to send entries to your event……. Love that tadka with fried onions! Looks great! this sounds yummo, raji. never tried this version before. hope i can participate in your event and send in some entries. damn! i just cooked for people weekend before last and all the recipes are in my blog but i dont have a final pic 🙁 i hardly ever entertain either..
sigh.. nice idea for an event though.. Vibrant and pretty pics. And happy hosting the event. Wow! you have taken the humble jeerai kootu to another level with the addition of coconut and the onion tempering! Great recipe! Hi, Super blog & great Picture. Hats off. I am a blog-beginer from Bangalore. Hav a look @ my site whenever u find time..
Lovely kootu…what a great event dear…will definitely help us to get some ideas…. Wow looks so yummy. nice click. What great pics Raks..cant stop drooling..I hav tried this with toor dal but not with moong dal..will do tat next time..n this sambar powder always confuses me..u have alink of it here?else could u please share it with us? Nice click dear!! u r really patient enough to take step by step pics ..
i loved keerai kootu, looks soooo good! nice idea for event, i'll be entertaining few guests in august so the timing is perfect! Awesome click as usual Raji… Do you use a SLR camera. I am thinking of buying one too..
Any dish with greens is tempting to me… Looks awesome! this looks very nice!! Love the theme of your event will try and send in something! lovely green kootu. Have aproper menu for the event. will send for the event. Great event,It will help most of us as we tend to be in a dilemma of what to cook when guests arrive. Kootu looks delicious. I normally will not add rice powder, should try next time. the kootu looks great! the pics look amazing. Hi Raji , Please collect the award from my blog . Count on my entry too. I am visiting your blog first time and will return again. Do find time to dig into my space and leave me a note. Please pick up your awards and tags from my blog. Delicious kootu.. Even i love it..! Yummy! And not to forget your Keerai Kootu looks yumm and tempting! Hey…would love to participate…but have a tiny doubt…i have the starter and dessert not in the same picture…and they are not indian dishers…it is ok? just had guests last evening..have individual pics but not together,,too bad i cany take part..will c next time! Just dropped in my entry…. Nahiiiin!I don't have any pictures of whole spread. I don't have many guests first place. And by the way nice kootu 🙂 Come, participate in my event! Some of the traditional recipes in your "Raks" blogspot Rocks!! I tried this Koorai Kootu with one variety of thandu keerai we get here in the US (not sure of the Keerai's name). It simply tasted awesome. We as a family had it mixed with rice, as a side for chappatis and it was very good. Thanks for this recipe. I think the trick is adding ground coconut+rice flour and brown roasted onions. Yum! Raji, I tried dis yummy kootu:) so tasty:) no tamarind…no tomato..still so tasty:) could do it in minutes:) nice option for spinsters lik me:) thank u:) I decided to try many more!!! please can you tell me what is this KEERAI and MOLAI keerai i would like to make eat assoon as possible by look only i cant resist leaving the receipe page can you answer my comment. You are the Mother if all Recipes … Love u Sis … God Bless You !!! I LIKED THE PICTURE AND THE RECEIPE SEEING ONLY I FELL LIKING EAT IT LOOKS SO VERY VERY TASTY BUT TO TELL YOU I WANT TO KNOW WHAT IS KEERAI KOTTU WHICH VEGETABLE IS IT I KNOW ITS GREEN LEAFY VEGETABLE BUT I STAY IN GOA SO WHAT ITS THE OTHER NAME FOR IT PLEASE DO LET ME KNOW. I HAD MAILED BUT YOU DIDNT REPLY PLEASE DO REPLY NOW. SORRY FOR TROUBLE AND THANKS A LOT FOR SHARING YOUR RECEIPE. Hi Rena, it is Amaranth leaves. Let me know if you still having trouble in figuring out the spinach. Thank you so is it spinach? OR Amarnath leaves n spinach are same? Some one from here told me it might be bachala its like creeper n leaves are like money plant but thin n green in colour. so please do reply to my mail n thank you once again.and my name is Rehana. In this while grinding, add little cumin(seeragam) gives a great taste. Can I make this kootu with palak leaves ? I havent tried, but why not? You can try. Shall we use arai keerai instead of this ?